Founded in 1959, Generac was the first to engineer affordable home standby generators, and today is the global leader for domestic backup generators. The Generac range now expands well beyond just home backup and manufactures best in class portable and stationary generators for small to large commercial and industrial operations also. With a focus on leading the market in fully automatic transfer switches and accessories for backup power applications, Generac are a premium choice for home and business back up power during an outage. Generac also excel in the power washer category, featuring a full line of industry-leading power washers suitable for essentially any application, from the simplest home cleaning tasks right through to the toughest commercial and industrial environments. The imported generator range into Australia includes natural gas powered auto-start back up units for the home or small business, as well as petrol powered AVR models designed for worksites, events and farming. Generac 8kVA AVR Gas Standby Generator, Auto Start, 5 year warranty. Generac 10kVA AVR Gas Standby Generator, Auto Start, 5 year warranty. 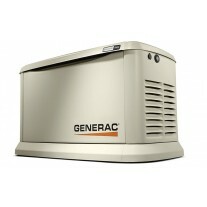 Generac 13kVA AVR Gas Standby Generator, Auto Start, 5 year warranty.